An interview with Pewter Games and Charles Cecil. 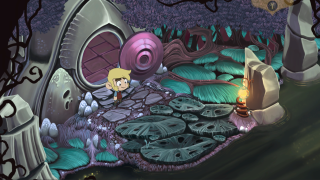 The Little Acre is an indie adventure game with a striking hand-drawn art style that’s set for release on PC on December 13. It’s being developed by Pewter Games, a small studio based in Dublin, Ireland, and its executive producer is Charles Cecil, creator of the Broken Sword series. I talked to Cecil and Pewter co-founders Ben Clavin and Christopher Conlan about what we can expect from the game.